Following RAW on Monday night, there has been plenty of internet rumour and speculation regarding the main event of the show. Apparently the original plan was for Big Show & Mark Henry to take on Erick Rowan & Luke Harper. We assume this would have been a normal tag team match, not part of the main event, but lower down the running order. 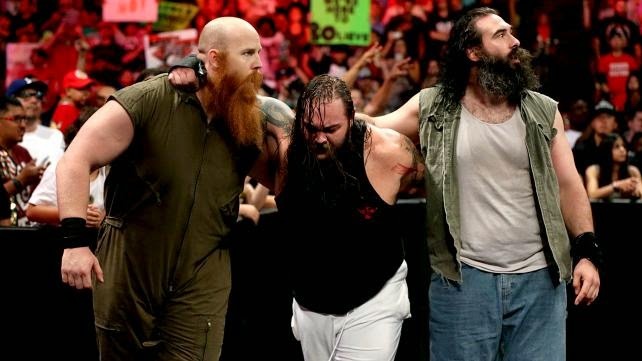 During the planned tag team bout, the apparent plan was for Bray Wyatt to attack Big Show after the match. Some sources suggest that Wyatt would have hit Big Show with his 'Sister Abigail' finisher and this would have given him a bit of a push coming out of RAW. Allegedly plans changed as late as the afternoon in the run up to RAW. This meant the main event for RAW became the 'improptu' six man tag match that we got instead - Followed by Cena AA'ing the entire Wyatt family. This has angered certain sections of the Wyatt fanbase, as they feel Cena was put over at the expense of Bray. Whatever the truth may be - The main event of RAW was extremely messy and disappointing in our view.